West Coast Campervans launch Classic Volkswagen Camper Hire! 22nd July 2015 12:59 pm Comments Off on West Coast Campervans launch Classic Volkswagen Camper Hire! 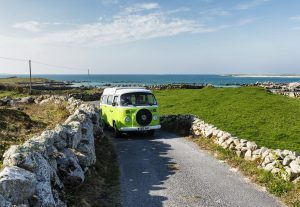 West Coast Campervans have become the first Irish Campervan Hire company to hire the new generation of famous Volkswagen Type 2 Campervans manufactured by Volkswagen and powered by fuel injected, modern engines. Click here to check out our VWs. Modern technology enables you to enjoy the traditional looks of the Original 1970’s VW Camper combined with the reliability, driveability, safety and fuel efficiency of a modern vehicle. All concealed beneath the iconic, old-style exterior! The VW camper is the original campervan and has been the vehicle of choice for globe trotters, festival goers, surfers and rock stars since the first one rolled off the assembly line in Germany in 1950. With a VW camper, ‘it’s not about the destination, it’s about the journey’. What could be better than rambling around the Irish countryside looking out the wide bay window of a VW camper? This reliable, practical vehicle is ideal for a couple, small group or small family who want to tour Ireland. West Coast Campervans are keeping the VW Type 2 Camper legend alive with their modern Volkswagen Classics. Click here to check out our VWs. © 2019 West Coast Campervans. All rights reserved.